I think it captures a little bit of what’s so beautiful about our collaboration, and what people in the gallery respond to with such enthusiasm and emotion. I find that Atzi’s performance gives me, and everyone else, a chance to slow down and contemplate, to remember why all these paintings are here in the first place. It’s an appreciation of being alive, it’s pretty much the meaning of life if you’re an artist in any form. Each time we collaborate I’m reminded anew of what’s so rewarding about the process: while I’m in the place I’m painting, and throughout the painting process, I’m constantly researching – reading, talking to people from the place, exploring everything about the landscape that makes it unique and compelling. Atzi’s response feeds that experience back and extends it, even if we haven’t discussed all the inspiration behind the paintings. I’ve learned to simply trust that he’ll ‘get’ it. 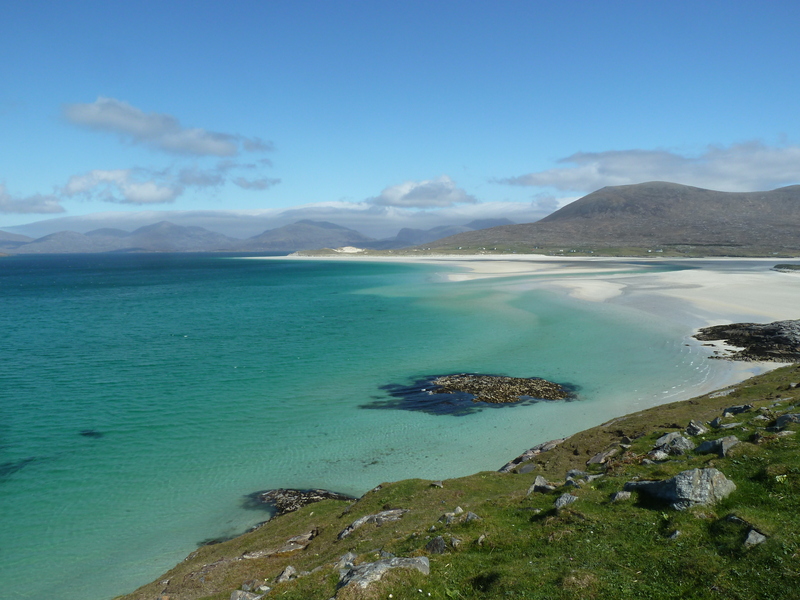 Everyone travelling to the Isle of Harris tells you that you must visit the turquoise seas and white sands of Luskentyre on the west coast, and so you must, it’s beautiful, almost incredible visually! But I was also reading about the islands – (I recommend Bill Lawson’s Harris in History and Legend) the origins of people, the possible meanings behind the stones of Callanish on Lewis (particularly the significance of the moon in its formation), the music, poetry and of course the tough lives of the islanders who lived there over thousands of years through constant challenge and change. You find it in the place names; echoes of Viking culture – Gaelic and Norse combined, you see it in the ruined houses, abandoned crofts or fishing piers, or the long, black seams of peat (the sole source of fuel in past times) cut into rain and wind-lashed hilltops. 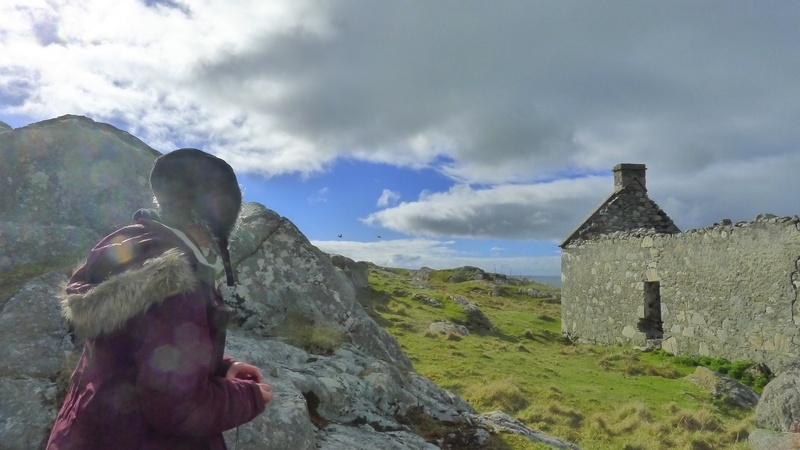 Ordinary people here certainly suffered at the hands of land owners’ whims – the ever changing, or failed, industries, the Clearances of course and not least the hard rocky ground and wild winter weather that made farming this land so arduous. They’re still here though, the Scottish Gaelic language survives, as does the humour, the story-telling, art, music and poetry. Much of all this is there in my paintings if you’re looking for it. Atzi Muramatsu’s cello playing brings it back to life for me. When I heard these three music pieces in the gallery I was transported back to Harris, re-experiencing the darkness and light I discovered there. Music lovers will hear a bit of everything, from playful Scottish reels to the darkly Baroque, then avant garde dissonance, but also wonderful expression and interpretation absolutely unique to Atzi. And remember, all of this is improvised response! 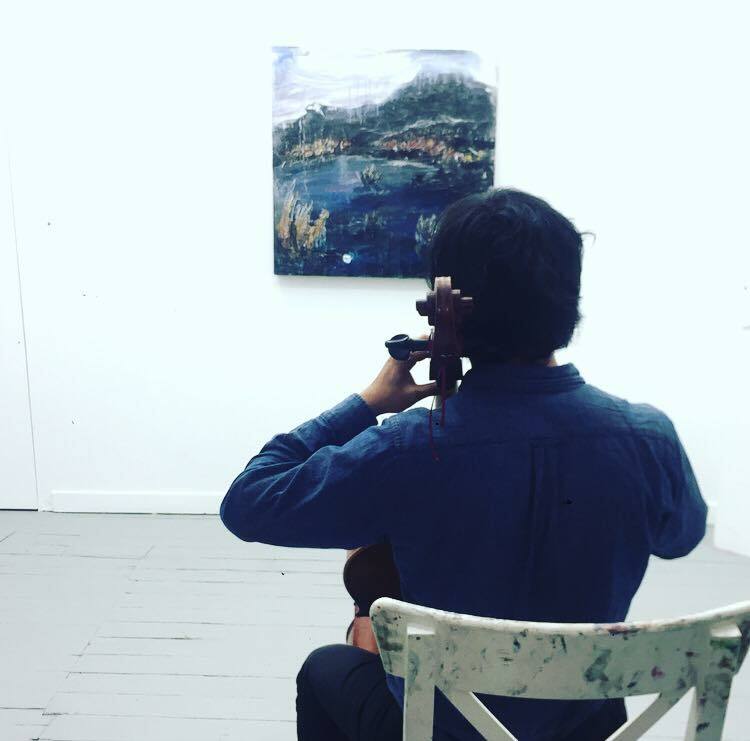 This entry was posted in Uncategorized and tagged improvised cello, isle of harris paintings, music and image, Scottish landscape painting on July 19, 2017 by rosestrang.